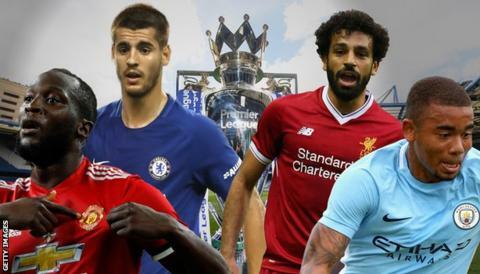 It is that time of the year again and the most contentious pre-season task of all - picking who will finish where in the Premier League in the 2017-18 campaign. The big money is spent and will continue to be spent even after the season gets under way this weekend. So here goes with the crystal ball - and with the usual safety net excuse that these placings could yet be moved around by some more heavy lifting in the transfer markets before the end of August. Pep Guardiola's arrival at Etihad Stadium last summer was greeted with an excitement and expectation which was ultimately unfulfilled as they finished the season without a trophy and in third place in the Premier League. There were flashes of the scintillating attacking style the Catalan wants but too often City were fragile in defence. Guardiola has embarked on some spectacular - not to mention costly - renovation work on his defence. Ederson has replaced the flawed Claudio Bravo in goal and the failure to put a succession plan in place for ageing full-backs has been remedied by the arrival of England's right-back Kyle Walker from Tottenham and Monaco's Benjamin Mendy on the left for in excess of £100m. Real Madrid's Danilo also adds further defensive versatility and ability. City's attacking riches are already in place and look for Gabriel Jesus to emerge as a Premier League superstar this season. This makes City the champions. Antonio Conte's miraculous rebuilding from a 10th-place finish to champions last season was a superb feat of management. There has been turmoil around Stamford Bridge this summer, with Diego Costa's discontent providing the backdrop along with questions about Conte's own future before he signed an improved two-year deal. Chelsea, however, will still be hugely formidable although it remains to be seen whether the decision to sell Nemanja Matic to rivals Manchester United is a wise one. Conte, having appeared to pursue Romelu Lukaku, will be delighted to have landed one of his personal favourites in Alvaro Morata from Real Madrid while Tiemoue Bakayoko's arrival from Monaco will be expected to offer a more youthful and athletic alternative to Matic. No title - but a very good shout for a cup. It is testimony to Jose Mourinho's built-in winning mechanism that a campaign that appeared a disappointment for so long still ended with Manchester United winning the EFL Cup and the Europa League, confirming Champions League football this season. United and Mourinho will be under pressure to offer a serious title challenge this season and I expect them to do so. Victor Lindelof from Benfica will be asked to provide added central defensive reliability with the shield offered by midfield enforcer Nemanja Matic. The big arrival, however, is £75m Romelu Lukaku from Everton, apparently stolen from under Chelsea's nose. Lukaku will be under huge scrutiny to deliver but his track record suggests he will. The Belgian has been accused of being "a flat track bully" - United should not worry too much about that because that is exactly what they required during too many draws against sides beneath them last season. Mourinho will be back in the title shake-up. Strange summer for Liverpool and manager Jurgen Klopp - and at this stage it is a slight leap of faith to back him to deliver another top-four finish but he is moving his club in the right direction. Mohamed Salah's arrival from Roma offers even more pace and movement to an attack rich in those qualities with the likes of Sadio Mane, Roberto Firmino and Philippe Coutinho. Liverpool will watch developments on the south coast with interest to see if there is any way of reviving the fractious deal for Southampton's Virgil van Dijk to bolster a vulnerable defence and RB Leipzig midfielder Naby Keita remains on the radar. The big question mark is the future of Coutinho. Klopp and Liverpool are understandably bullish about their refusal to sell - but Barcelona do not normally just walk away. The outcome will be crucial to Liverpool's season. Arsenal finally slipped out of the Champions League places last season after a campaign which contained much acrimony and discontent at Emirates Stadium, but which was salvaged to an extent by an outstanding FA Cup final win against Chelsea. Arsene Wenger, the central figure in so much of that debate, has signed a new two-year deal and the French manager want to make a fast start to ensure there is a feel-good mood around Arsenal. Sead Kolasinac will add muscle at left-back while the highly regarded Alexandre Lacazette has arrived from Lyon with many suggesting he is a guarantee of goals. Wenger insists Alexis Sanchez will not be sold but there will still be much relief if he is still a Gunner at the turn of the month. If he stays, and Wenger says he will, then Arsenal can flourish. Still some questions though - and Wenger does not need any early slip-ups. Rather like my slightly wayward prediction of Leicester City's relegation before the season they won the title, this is a prediction that bears all the hallmarks of coming back to haunt. Spurs have proved an outstanding team over the last two seasons but have yet to win a trophy - this placing is also heavily influenced by the fact they have yet to strengthen this summer. Manager Mauricio Pochettino has a top-class first team but still needs high quality cover for Harry Kane and chairman Daniel Levy should also be scouring the markets to improve what he has. And how will Spurs cope with playing their matches at Wembley, where their recent record is so poor? I will not be surprised in the slightest if Spurs defy this current placing, but just one or two questions to be answered at this stage of the summer. Fancy them very strongly for a cup this season. Everton are a club on the move under manager Ronald Koeman and major shareholder Farhad Moshiri. Their summer transfer business has been highly impressive, with signings for the future in goalkeeper Jordan Pickford, England defender Michael Keane and exciting Spain Under-21 striker Sandro Ramirez, with former Ajax captain Davy Klaassen expected to provide goals from midfield. There is justified optimism around Goodison Park, with Gylfi Sigurdsson expected to arrive from Swansea City in a club record £50m deal, and that will only increase if Wayne Rooney can roll back the years after his return to Goodison Park. The minus has come with the departure of Romelu Lukaku to Manchester United. Koeman has yet to land the front line striker to replace his goals and presence - Everton also appear to lack pace. Ross Barkley also looks to be on the way out but Everton are on the up. Do not expect them to finish any lower than last season but they may need a couple more transfer windows to seriously infiltrate the top six. It was an unsettling first season at London Stadium for the Hammers, away from the home comforts and familiar surroundings of Upton Park. There may also be a slight false start this season with home fixtures delayed after the World Athletics Championships but expect better from Slaven Bilic's side after some very interesting work in the transfer market. England goalkeeper Joe Hart will hope to prove he is not in permanent decline in a World Cup year after his loan move while former Manchester City team-mate Pablo Zabaleta will provide steel and consummate professionalism. Javier Hernandez, goal poacher par excellence, may yet prove to be a masterstroke while Marko Arnautovic is a talented wildcard. Leicester City looked much more like the side that won the Premier League after Craig Shakespeare took over from the sacked Claudio Ranieri last season - but will full command be different to temporary charge for a talented coach? Riyad Mahrez's future remains in doubt but the Foxes have shown their ambition with the arrival of Kelechi Iheanacho from Manchester City, while plenty regard the signing of Vicente Iborra from Sevilla as a coup. Shakespeare will hope there is no more upheaval before the end of August, with Chelsea being linked with midfielder Danny Drinkwater. And with one or two more additions (Harry Maguire may prove a shrewd acquisition in defence) then this could be a very decent season at the King Power. Bournemouth will be starting to feel almost established in the Premier League now as they enter their third season, still with manager Eddie Howe and the likes of top scorer Josh King. And this status is reflected in the additions they have made to the squad in the summer. Asmir Begovic is a goalkeeper of experience and reliability, Nathan Ake is a defender of rich promise while Jermain Defoe will hope to continue the Indian summer of his career towards next year's World Cup with England in Russia. Bournemouth and Howe are growing together and I expect that to be reflected in another season of good consolidation. Can ex-Sunderland striker Jermain Defoe build a scoring partnership with Joshua King? Any prediction about Newcastle United always comes with a variety of strings attached - and this is no different. Manager Rafael Benitez's relationship with the hierarchy has appeared strained at various stages of the summer, a situation not unfamiliar for either party throughout their history. Benitez's Premier League experience and his bond with the Toon Army means it is vital he feels comfortable in his role. The effects of anything otherwise could be catastrophic for Newcastle. The so-called marquee signing may not have arrived on Tyneside yet but Benitez is the most important figure in Newcastle's dynamic. If he goes, all bets are off. If Benitez feels confident and settled then expect a comfortable mid-table finish and he has always enjoyed a cup run. The Toon Army, however, will have its fingers crossed. It has been a relatively quiet summer at The Hawthorns, although it remains to be seen how important the loss of the influential Darren Fletcher to Stoke City proves to be. Striker Jay Rodriguez is a real talent who has suffered cruelly with injuries but manager Tony Pulis will hope he regains the form and influence that won him England recognition. And while he is an acquired managerial taste to some, Pulis keeps teams in the Premier League with the minimum of fuss. Expect the same again. Palace are another club who will now be feeling a sense of permanence in the Premier League - but once again suffered managerial musical chairs with the surprise resignation of Sam Allardyce after he guided them away from relegation last season. New manager Frank de Boer is a personality of real pedigree who is looking to re-establish himself after a brief and bruising experience at Inter Milan following success at Ajax. De Boer must get used to life in the Premier League but Palace have firepower in the shape of Christian Benteke and Wilfried Zaha, while Ruben Loftus-Cheek is a smart addition on loan from Chelsea. Palace should have enough to survive with a little to spare. New season. New manager. New season. More speculation about their best player. This seems to be life almost every summer at Southampton as Mauricio Pellegrino replaces the sacked Claude Puel, who seemed harshly dealt with after an eighth-place finish and a Wembley final, while Virgil van Dijk sits on the sidelines declining to figure in pre-season as he craves a £60m move to Liverpool. Southampton seem to thrive in this environment but surely there will come a time when they cannot pull off this trick of succeeding surrounded by such turbulence. The Saints will not struggle for a moment but I do not expect them to be as high as in recent seasons. It will be interesting to see how Italian Manolo Gabbiadini fares after an outstanding introduction last term. He will be a crucial figure. There was a real sense that Stoke City were running out of momentum under Mark Hughes last season. Some of the old menace had gone and they were too tame on too many occasions. Still formidable on their own ground but Hughes will need a good start to deflect some of the criticism that was aimed his way last season. Darren Fletcher will be a steady presence in midfield while Kurt Zouma is a very good defensive addition - but how much will the 'X Factor' provided by the unpredictable Marko Arnautovic be missed? Big season for Hughes. Good start essential. Paul Clement did a fine job in pulling Swansea City out of a desperate situation last season and survival could well be regarded as success for the Swans this season. Tammy Abraham will arrive on loan from Chelsea with high expectations and a growing reputation while Roque Mesa from Las Palmas has the air of a deal conducted under the radar that might just have other clubs looking on in envy in the months to come. The big question surrounds the talisman Gylfi Sigurdsson, the source of so much inspiration and seemingly on his way to Everton. Can Swansea find the players to replace what the Icelander gives them? How Clement tackles this may shape their season. Burnley's survival last season was built on the foundations of Turf Moor, the glorious old stadium where they proved so tough to beat. The Clarets have lost their outstanding defender Michael Keane to Everton, but still have the fine goalkeeper Tom Heaton and, most significantly of all, manager Sean Dyche. He has added some real battle-hardened Premier League edge in Jon Walters and Phil Bardsley, while Jack Cork and Charlie Taylor will also make a contribution. Could be some suffering along the way but I think Burnley will stay up. What to make of Watford? Another new manager and this time it is the highly regarded Marco Silva, the man who produced a revival of sorts at Hull City last season but ultimately could not prevent relegation. Some questioned Silva's glowing reviews on the basis of his inability to get results away from home - this season at Vicarage Road will provide a clearer picture. Interesting signings such as Will Hughes from Derby County and Nathaniel Chalobah from Chelsea… but I fear a season of struggle for the Hornets. Now this is an interesting one. The Pride of Yorkshire and the great Championship story of last season - and this is a prediction made with no huge confidence. Huddersfield defied the odds so brilliantly last season that to write them off before the season is fraught with danger. Manager David Wagner is an inspirational figure, they will be backed by fervent fans and their work in the transfer market, done early and with clear focus, shows a club with a plan. This is a unified force. Australian midfielder Aaron Mooy, signed from Man City after spending last season on loan at John Smith's Stadium, will be crucial once more and Benin international striker Steve Mounie has shown good things already. Winger Tom Ince, signed from Derby, finally gets the chance to prove he is Premier League quality. The fear is their rivals will just have too much over the course of a long season - but I will be delighted to be proved wrong. Think the relegation places will be a serious dogfight this season and a blanket could be thrown over the bottom five here. Chris Hughton has done a superb job to take Brighton up after the disappointment of just missing out before. This is a club with real potential who could thrive if they survive this first season back. Transfer dealings have been steady and new goalkeeper Mathew Ryan, signed from Valencia for £5.2m as a replacement for David Stockdale, will carry much weight of responsibility, while midfielder Davy Propper has arrived from PSV Eindhoven for a club record fee. Izzy Brown from Chelsea adds pace but Brighton will hope the flourishes of brilliance from Anthony Knockaert can provide the match-winning moments to keep them up. Brighton will be a great place to watch Premier League football this season and all neutrals will wish them well. All transfers sourced from the Premier League website. All transfers correct as of 23:00 BST on 8 August. Take part in the Premier League Predictor game, which allows you to create leagues with friends.